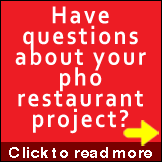 A reader asked me the other day about fresh banh pho and quality of fresh banh pho. The question is based on his personal experience and observation, but it's also based on some misunderstood facts. Anyway I just want to share my answer to the reader's question on fresh banh pho, and hope you'll find it an interesting read. My name is CG and I've been living and working as a journalist in Saigon since 2010. I'm writing a piece on the essential nature of fresh phở noodles for any decent bowl. To be honest, I've been consistently unimpressed with the phở I've eaten in the States and the source has always been the noodles. That said, I've never really given it a fair shake and have heard about fresh noodle makers in both Orange County and Houston. I was wondering if you'd spoken to those guys. I also wondered if you could comment, as a consultant, on the difficulty of providing fresh phở noodles in a restaurant. How long do they stay good? Are the bagged, oily "semi-fresh" noodles I see treated with something? Why do they seem to taste so bad? Anyhow, that's what I'm after. Your input would be greatly appreciated. I assume that if you’ve been in Saigon since 2010, then your knowledge about pho in the states is pretty much limited to before 2010. Additionally, it maybe true that your pho experience in the states are only limited to certain locality, as you didn’t say where you’re from and which cities you have visited and tried pho in. 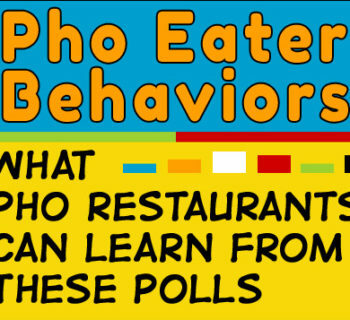 I wonder about these thing because they have important impact on your experience and views about pho that many non-Viet people have. For one thing, in Vietnam, you have Vietnamese living everywhere (of course), and the level of standards and expectations for a dish like pho is pretty much set. This is not true in the U.S. Here in the states, we have Vietnamese who know what we want in pho, and we have non-Viet customers who don't necessarily know what good pho is or should be. 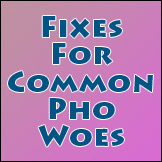 Many are still "exploring" pho. One had better serve good pho in Vietnam. If not, customers just take their business elsewhere. But in the U.S., when you have a pho shop serving not so good pho, customers debate what they like about it while others argue why it's not worth their money. I've even seen a few who are not familiar with good pho say "interesting twist on traditional pho" when to me, they just had a very bad bowl of pho. Many pho restaurateurs in the U.S. find ways to make money and stay in business this way, regardless of how good his pho is. Here in the states, one can actually survive serving junk pho, because according to the market, it's always debatable; something not traditional or as it should be is fusion, trendy. And as a result, pho quality vary greatly from one shop to the next. Ha! They don't call the United States the land of opportunity for nothing. I digress, but I think you get my point. Let's talk about banh pho. I know the state of fresh banh pho noodle in the states very well. There are only a handful (maybe 3) manufacturers of fresh banh pho in the states today. There used to be none, and restaurants had to serve the dry kind (which is not bad if prepared correctly). But today there is no shortage of fresh banh pho in the states unless you open in Montana or places with no real Asian/Viet population, where a supply chain is almost non-existent. With all that said, let’s clarify what is meant by “fresh” banh pho. In Vietnam, there is nothing other than fresh, as in made and served the same day. Fresh is great, but it’s more the result of people lacking refrigeration and storage space for long-term food storage at home and in many small pho shops. Remember, what you get at side street pho stalls and shops in Vietnam are not what Americans even consider “small businesses”. They’re just families out making a living and they would only get what they think they will sell for the day. They can’t afford or have room for refrigeration. They go to the market daily, many times twice a day, to purchase ingredients to cook. The fact is the vast majority of pho operators do not stock much inventory as do restaurants in more developed countries. In Vietnam of course there are large chain and national brand restaurants that have walk-in coolers and commercial freezers in their facilities. But we're not talking about those in this context. The vast majority of pho shops do not have proper commercial storage and lack of capital for inventory, both of which naturally force everything to be fresh, banh pho included. The net effect is the banh pho you get in Vietnam is truly fresh, much of which are made at a “local” home factory and delivered sometime 2-3 times a day on motorbikes. This is ok as long as you stay local, have small distribution radius, and customers do not think much about food sanitation and contamination. But as soon as your geographical reach is increased, you'll face the problem of distribution distance, product shelf life and storage, food safety, and across-state, across time zone commerce. I've even seen reports of the Vietnamese government cracking down on, or at least encouraging people not to buy, "home-made" banh pho due to contamination problems. We may see "fresh" home made banh pho going the way of the cyclo (xích lô) soon. This brings us the next reality regarding fresh banh pho. 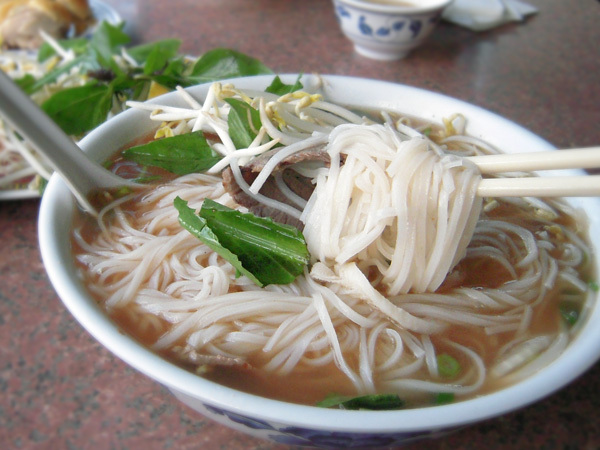 In North America, the health departments are not doing “fresh” banh pho any favor. Fresh banh pho is on the list of many health departments as one of the top items that can grow bacteria fast if left at room temperature. From the health inspector's point of view, fresh banh pho must be strictly temperature controlled. This means it has to be kept at or below ~40-41°F; a requirement that applies to all phases in the supply chain: from transportation, to storage and distribution, all the way through service. Therein lies U.S. pho restaurants' dilemma. Pho is supposed to be served hot. In Vietnam many ingredients in pho are served fresh at room/ambient temperature. In the states almost all pho ingredients have to be served from “safe” temperature of 40°F. One problem resulting from this is, even if you pour boiling hot broth, all the cold ingredients already inside the bowl will make your bowl less than hot when arriving at the table. Many restaurateurs try all kinds of tricks to solve this, some do well and others not so much. 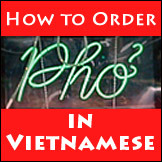 The banh pho factories in the states have equipment and procedures in place to meet U.S. FDA regulations, all administered and monitored by health inspectors. I’m sure there are regulations in VN too but you and I can pretty much agree that regulations are not strictly enforced unless you're a large factory, and as a result there are many small "factories" producing and selling fresh banh pho at every corner in every market. It's still a neighborhood economy in many parts of Vietnam. This may also have contributed to your perceived higher and fresher quality of banh pho in Vietnam. 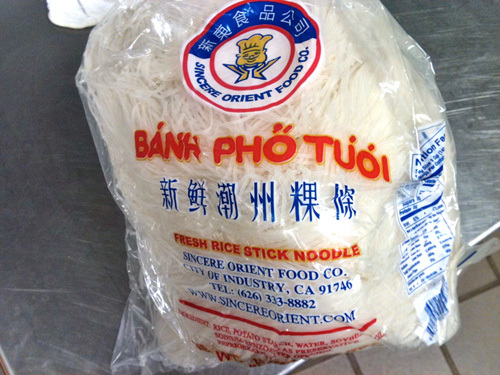 One large U.S.-based fresh banh pho maker is Sincere Orient based out of La Puente CA, just outside of Los Angeles. As you can envision, this is big operation with a huge facility. I’ve been to its facility and can tell you it cranks out large amounts of fresh banh pho, and it ships across North America to supermarkets, restaurants, distributor and wholesalers. 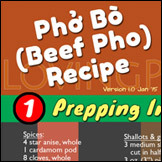 This version of fresh banh pho uses a combination of drying and cooling process to increase shelf life. Basically, it aims for a compromise. On the one hand, it's not "wet" fresh which results in only a few hours of shelf life at room temperature. And it's not exactly dry banh pho with long shelf life at room temperature either. These are the two extremes of banh pho, one of quality and the other one storability. The former compromises shelf life to provide the highest level of freshness, most of the time at higher cost. The latter aims for stable shelf storage and widest distribution reach, with much lower unit cost. Fresh banh pho such as provided by Sincere Orient is a good compromise because it retains moisture (hence is susceptible to bacteria growth and requires refrigeration) and is pliable, not brittle. This means it can withstand bulk packaging, is much easier for delivery and handling without breaking apart. And it's fresh enough to only requires 4-6 seconds of blanching before serving. This fresh banh pho has great texture after a very quick blanching, and is almost like the real thing. They ship banh pho out to markets by the pallets in huge refrigerated trucks, with proper packaging for wholesale and retail markets, and with proper labeling that includes ingredient list and nutritional values. “Fresh” banh pho in the U.S. means refrigerated for short distance travel (within CA or to Las Vegas for example), or frozen for shipping across the country (to Chicago, New Orleans, or Bethesda or even Toronto and Montreal CN). Regardless of what type of banh pho you use (dry or VN fresh or US fresh), it has to be cooked before serving in pho or hu tieu. The time can range from 4-6 seconds for fresh banh pho, to 8-10 minutes for dry banh pho. 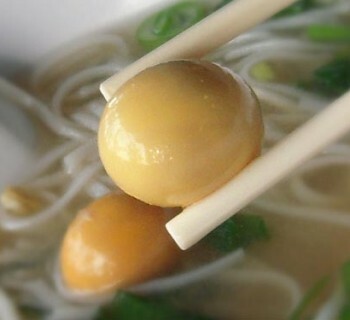 Not too unlike pasta, the quality of pho noodle experienced at the table is a function of the amount of heat and time used to cook it immediately before serving. I can tell you, in my experience in working with restaurant owners in the U.S., a large number of pho restaurants don’t know how to cook pho noodle correctly. 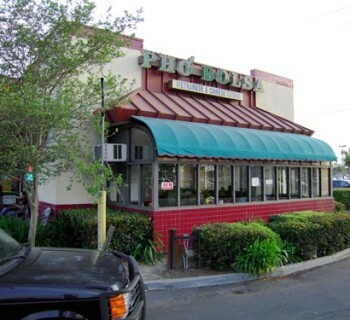 Many U.S. pho restaurants don't care much about quality, it's sad to say. For small street side pho shops in VN, the operator has to know what he/she is doing. If a pho shop owner in Vietnam messes up on the banh pho, the shop will lose customers so fast they would have to close shop. This is another reason for your perceived differential in banh pho quality. Their livelihood is right in their own hands every day, and they can't afford to not serve the best pho each and every time. Finally, if you’re a journalist and plan to write about this subject, I encourage you to step back and look at what you’re really trying to accomplish and what is actually being compared and contrasted. Without getting too technical about it, in my professional opinion, when you talk about banh pho quality, invariably it boils down to taste and texture. Not just taste as you originally referred to as the symptom of bad banh pho. When it comes to pho as a dish, most consumers care about banh pho texture more than taste. In fact, for Viet and non-Viet people alike, rice is rice, and rice noodle is rice noodle. For a product that is as pure rice as banh pho, they all taste pretty much the same. What’s arguable about banh pho is how much knowledge and care the operator gives to serve pho to his customers. The best result is always proper banh pho texture, not great banh pho taste. I’ve never heard someone complaining about spaghetti (the pasta) tasting bad, only about it not having been cooked correctly. So you may turn your discussion toward proper knowledge and technique of the seller instead of (or in addition to) just fresh banh pho in VN versus fresh banh pho in the U.S. In my personal opinion and many pho eaters in North America, the quality of banh pho here is as good as any other places. Pho restaurants are selling countless pho bowls a day, and pho eaters continue to slurp it up. To end this already too long post, here’s an anecdote you may enjoy. Many Viet people when first arriving in the states turn up their nose on mass-produced refrigerated or frozen or non-kicking fresh chicken and fish, saying food in VN is the best and freshest. They may be right but it only takes them a few months of high priced and rarely available kicking fresh foods to start buying food like the rest of red-blooded Americans do. It all boils down to what you can find, what you're willing to pay, and where you want to buy from. Share your comments in the section below.